The Leadership Positions page allows you to view and define the leadership roles held by adults and scouts in your troop. It is located at Site Configuration → Leadership Positions-. Authorized users can add, delete and edit positions. Existing positions can be edited by clicking their respective Update buttons, and a new position can be created by clicking the Add a New Item button. Adult? indicates whether this position is held by adults. Leave this unchecked for scout leadership positions. Title is the name of this position. Code is the BSA code for this position. 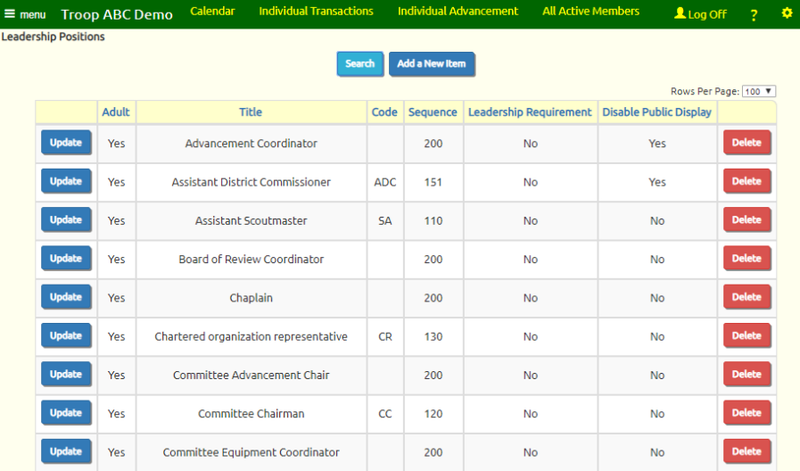 Display Sequence determines the order in which members with these positions will appear on some pages, such as the public Our Adult Leaders page. Positions with a lower number display sequence will appear before those with higher numbers. Qualifies For Leadership Requirement? only applies to scout leadership positions. It determines whether this position will be considered when computing the leadership requirements in the Leadership Rank Requirement Status Report. Note that the Bugler position does qualify for Star and Life, but not Eagle; this exception is hard-coded into the program. Do not display this position on the public Our Adult Leaders page will prevent leaders from this position from being included on the Our Adult Leaders page, unless they also hold another position which has not been excluded. Authorize For User Role allows you to link this position to a User Role. The system will automatically assign this user role to anyone who currently holds this position; when they leave the position, the role will be removed. Check the box for Receives Monthly TroopWebHost Newsletter to ensure that anyone who currently holds this position will receive the monthly email announcing the TroopWebHost newsletter. 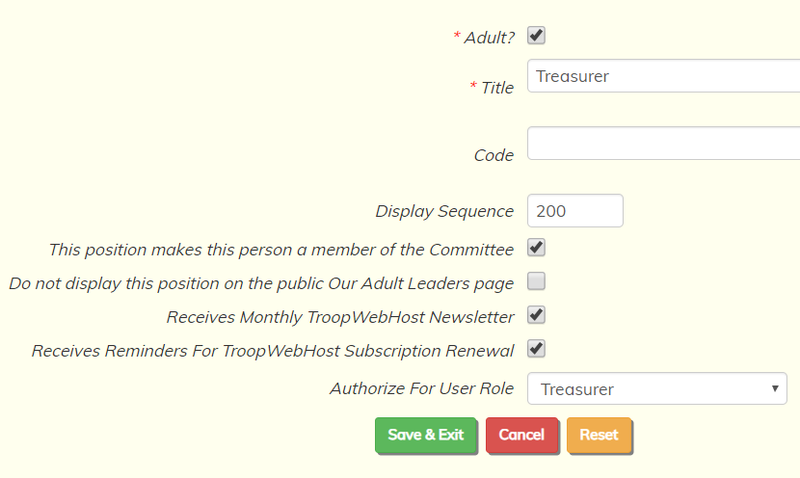 Check the box for Receives Reminders For TroopWebHost Subscription Renewal to allow anyone in this position to receive email reminders when your TroopWebHost subscription is due for renewal.